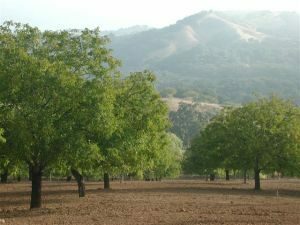 In the Adelaida Foothills of Paso Robles, Cynthia Douglas and Jutta Thoerner of Manzanita Manor Organics (also known as MM Organics) farm heritage Hartley and Franquette walnut trees. The property has been in agriculture since the 1800s. It was initially planted dry-farmed almonds until the 1930s when the previous owner switched to dry-farmed walnuts. 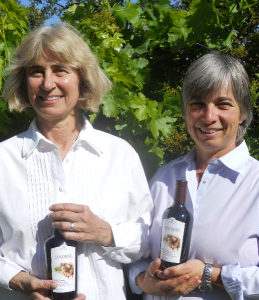 Cynthia and Jutta purchased their first eighty acres in 1992. Over the years, they gradually acquired neighboring properties. Their final purchase in 2013 brought their total acreage to 200 acres, including a five-acre organic Portuguese variety vineyard surrounded by Los Padres National Forest called “Two Horse.” Grapes flourish in the extreme temperatures of the region to produce estate organic Port-style dessert wine. MM Organics has been certified organic since 2003. Over the last several years of diminished rainfall, Cynthia and Jutta have had to contend with the death of 75 mature walnut trees. And because the last few winters have been mild, new invertebrate pests have emerged in the orchard, including the navel orangeworm, a pest that bores into the nutmeat. New pests often take hold when weather and climate conditions change or because of a lack of sanitation, even from a neighboring farm. Although nothing can be done about the lack of rainfall, MM Organics took steps to protect soil moisture, changing the timing of the spring disking-under of the fall planted nitrogen rich cover crop. Traditionally this was done in April and May, which worked fine in “normal” rain years. At the beginning of the drought, Jutta decided to move up the disking to February, when soil moisture conditions are better for dry farming. Besides the benefits of nitrogen fixing plants, often called “green manure,” the addition of biomass in form of oats and barley, once decomposed in the soil, benefits all soil organisms. Dry farming, done correctly, will leave a several inch surface “dust mulch” which preserves moisture in loamy soil year-round. Jutta first noticed the emergence of the navel orangeworm moth in 2014. While the damage to nutmeat was light, approximately 15 percent damage, being organically certified meant MM Organics needed to implement aggressive non-spray techniques. First, they placed 1,000 insect catching paper traps at a rate of 10 traps per acre. This method is approved for organically certified farms, and uses no insecticides; sticky glue on the bottom part of the trap and a lure that consists of a small bag of walnut meal. Pheromone traps are another organically-acceptable method that Jutta uses for the Walnut husk fly. This pest has not been an issue for them since 1995, but the placing of yearly traps and counting the flies that are caught are part of the farm’s integrated pest management (IPM) program. 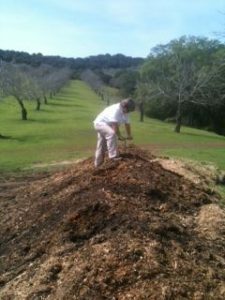 Second, MM Organics stepped up its sanitation practices, taking all of the nut “mummies” (unharvested walnuts) off the trees after harvest and disking deeply (at least one foot) to eliminate overwintering of moth larvae in the ground. MM Organics also takes a rather unusual approach to sanitation of the walnut floor after harvest by encouraging the coexistence of wild pigs and turkeys on the farm. These critters “assist” with pest management by finding and eating nuts left on the ground after harvest, thereby eliminating overwintering sites for the larvae of several species of moth. To encourage the wildlife, MM Organics left several large swaths of native hedgerows on the property, and provides fence-free access and water stations. In total, about half of their 200 acres is native California wood and grassland, which also provides habitat for pollinators and beneficial insects, demonstrating how seriously Jutta and Cynthia take their responsibility to coexist with wildlife. Challenges to Manzanita Manor Organics also come from beyond the borders of its property. Jutta believes that the appearance of the orange navel worm was due to the abandonment of a neighboring parcel of walnut trees. The nuts were not harvested, leaving the moths with ample nutmeat on which to feed deposit their eggs. Once the land sold, Jutta was able to impress on the new non-farming owner the importance of sanitation practices. The high labor costs associated with hanging and maintaining the paper traps on steep orchard slopes was a monetary and logistical hardship. While it will be necessary to continue the trapping program for the orange navel worm, this year Jutta will use her horses to access the steeper slopes of the orchard in hopes of reducing labor costs. Because of the drought, MM Organics ceased replanting and grafting young trees between 2013 and 2015. In 2016, three years worth of planting was done, and MM organics utilized a different technique–bud grafting as opposed to bark grafting–to further reduce stress on the trees. Tree health has shown improvement as a result of disking earlier in the year, as indicated by reduced canopy dieback in the walnut trees. MM Organics hopes that deferring grafting and tree planting during high-stress drought years will increase survival by 70-80 percent as compared to 50 percent in a drought year. The farm’s aggressive action to combat the orange navel worm was a big success. Because MM Organics does their own shelling, they were able to observe that in 2015, there was only moth infestation in one area of the orchard, and that infestation was in the 3-5 percent range.